...Hannah Katherine Parnell, of course. Thanks to all who have been praying for us and the arrival of our precious Hannah-Kate. She made her grand entrance at 3:12am this morning (Oct. 25). She weighed 6 lbs 7 oz and was 20 inches long--the exact size of her big sister. Congratulations! So exciting, can't wait to meet her! Congratulations Parnells! We are so excited for you guys! I can't believe Hannah-Kate was the same EXACT size as Elizabeth! What are the chances? You look absolutely amazing and glowing! We are praying for an easy transition time for you guys in the weeks to come. 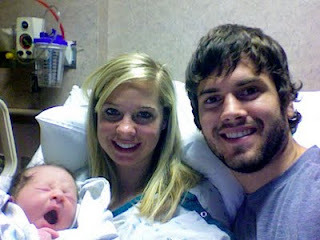 congratulations, parnell family! so glad you didn't have to go over your due date! We are praying for continued good health and are thankful for the safe delivery. i love her, she is absolutely beautiful just like sweet little E! Beautiful! Her cheeks do look a little bigger than her big sister, my weight guess was very close! I can't wait to spoil her and her BIG SISTER at Christmas, what do they want? !I love all FOUR of you! Janna and I send our congratulations! We're so happy for you! Elizabeth and Hanna! How wonderful! Jon is now significantly outnumbered! congrats to you all! Praise God from whom all blessings flow!